The next morning my dad's situation didn't improve -- in fact at one point he fell in the bathroom and my mom had to get my uncle who was traveling with us, to come and help pick him up from the floor. After a mini conference that included three doctors, it was decided that my dad should go to the hospital for a CT scan. 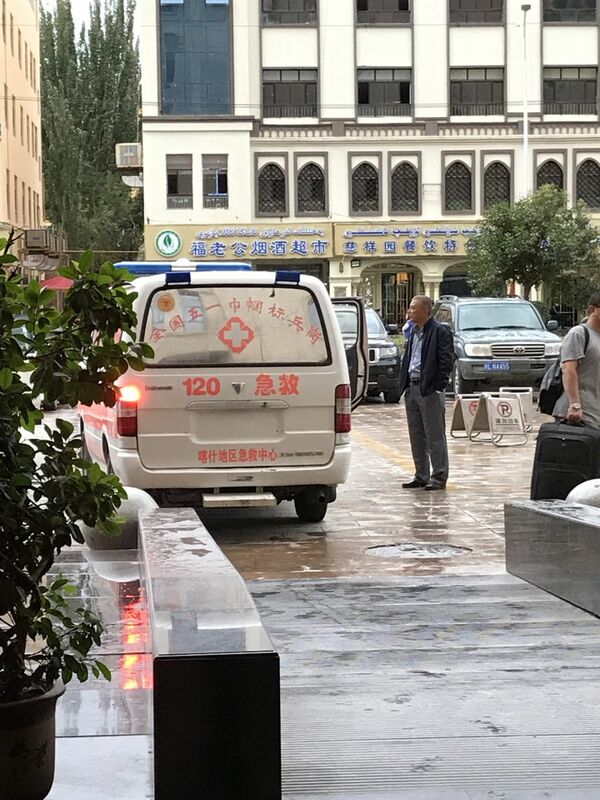 Our tour guide arranged for a non-emergency ambulance to come and take him to Xinjiang Kashgar First People's Hospital -- the best hospital in the city -- but a traffic jam resulted in the ambulance instead driving to Xinjiang Kashgar Second People's Hospital which was closer to the hotel. The hospital looked drab and since my mother, her good friend and I followed in a taxi, we weren't quite sure where to go look for my dad. 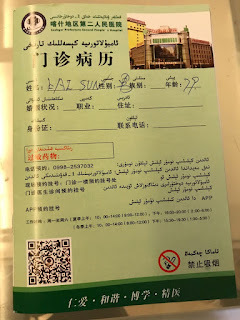 We soon realized we were in new territory, as most of the patients were Uyghurs and some of the staff were Han Chinese. 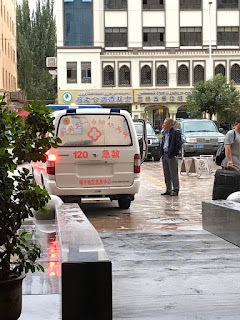 After asking reception a few times in Mandarin, we finally got some directions and managed to find him in a nearby building with two of his doctor friends. The CT scan did reveal a blood clot and the medical staff there -- in particular the administrator -- insisted that we had to stay and do the operation in the hospital. One of the doctor friends -- the one who first assessed my dad -- was insistent that it not be done in this hospital which didn't seem to have the highest hygienic standards. He called long distance to a neurosurgeon he knew in Vancouver and briefed him on the situation. 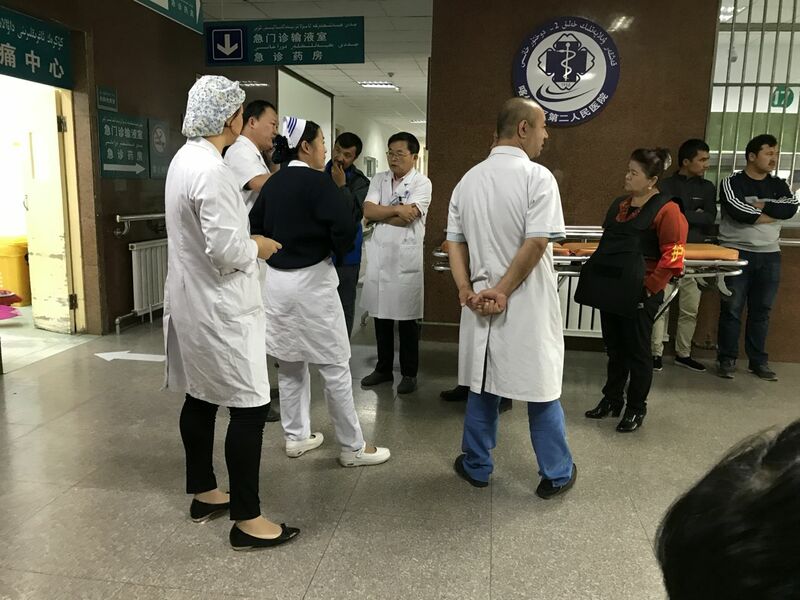 At this point there was a bit of a standoff between the Han Chinese and Uyghur medical staff and us as to what would be best for my dad. Seeing him lying in a bare bones room didn't seem to be the best option for him, and yet the Chinese administrator claimed my dad was in no condition to leave the hospital. Finally our insistence was respected -- but not without signing several forms saying the hospital was not responsible for what happened to my dad. My mom had to sign the forms and put a red thumb print on top of her name. That's what you call double-step verification Chinese style. Eventually he was released and we all returned to the hotel in time for a late lunch. During lunch we made calls to my dad's medical insurance company in Quebec, Canada, and after listening to the situation and seeing pictures of the CT scan, they insisted my dad could not fly in his condition and that he had to be "treated locally". Our doctor friend tried very hard to explain where we were (we're in a remote area in China!) and the conditions of the hospitals here, but the insurance company didn't seem to care. I would later find out that flying in dad's condition would have been impossible. in the evening we gathered again for another conference, and there were suggestions of getting into Xinjiang Kashgar First People's Hospital tomorrow morning. And then someone threw out the idea of going now to avoid traffic jams. By now it was 11pm and I contacted our tour guide again -- can you help us arrange for an ambulance to take my dad to the hospital? The guide rushed over and accompanied my dad, the doctor friend and my mom in the ambulance. I was not far behind with my aunt and uncle. It was going to be a long night ahead.